Jaipur: Chris Gayle hit a belligerent half-century as Kings XI Punjab registered a convincing 14-run win over Rajasthan Royals in a controversial Indian Premier League match here Monday. Opening the innings, Gayle started in an uncharacteristic fashion but grew in confidence as the innings progressed and helped Kings XI post a challenging 184 for four after being sent into bat. Gayle scored 79 off 47 balls and hit eight boundaries and four sixes in the process. Besides Gayle, young Sarfaraz Khan (46 not out off 29 balls) also played a good hand. Chasing the stiff target, Jos Buttler (69) and skipper Ajinkya Rahane (27) got Rajasthan off to a brisk start, dealing in boundaries and sixes to pile up 64 runs in the first six overs of powerplay. Buttler, in particular, looked in a destructive mood as he didn''t spare a single Kings XI bowler and struck eight boundaries and two hits over the fence to notch up his fifty in just 29 balls. Buttler and Rahane shared 78 runs in eight overs for the opening stand before the Rajasthan skipper was cleaned up by his Kings XI counterpart Ravichandran Ashwin. Buttler was going strong in the company of Sanju Samson (30) as they duo batted sensibly to keep Rajasthan in the hunt. But just when it seemed Kings XI were running out of ideas, skipper Ashwin did the unthinkable as Buttler became the first victim of ''Mankading'' in the history of IPL. A desperate Ashwin mankaded Buttler in controversial circumstances in the 13th over with Rajasthan scoreboard reading 108 for two. At that stage Buttler was going strong at 69 off 43 balls. The dismissal is sure to raise fresh debate over the spirit of the game as Ashwin didn''t give the Englishman a prior warning. As expected Buttler seemed furious and had a heated exchange with Ashwin before leaving the field after the third umpire ruled him out. That dismissal completely changed the complexion of the match in favour of Kings XI as Steve Smith (20), Samson, Ben Stokes and Rahul Tripathy departed in quick succession in search of quick runs. From there on, it proved to be an uphill task for Rajasthan as they needed 27 off the last two overs with six wickets down. Earlier, Rajasthan''s decision to bowl first on a two-paced wicket was bang on target as K L Rahul lasted just four balls before edging an outgoing Dhawal Kulkarni delivery to wicketkeeper Buttler, who took a brilliant one-handed catch. Gayle and Mayank Agarwal (22) then struggled to hit big shots against Kings XI''s disciplined bowling as they garnered just 32 runs in the powerplay overs. The dou finally broke their shackles, hitting Jaydev Unadkat for a four and six to yield 13 runs of the bowler''s opening over. Gayle then opened up his arms again and hit Krishnappa Gowtham for a maximum in the first ball of the ninth over. But Gowtham broke the 54-run stand between Gayle and Agarwal after the latter was holed out a long-off by Kulkarni. Brought back into the attack in the 12th over, Unadkat was taken to the cleaners by Gayle as he hit the left-arm pacer for three consecutive fours and then a straight six over the bowler''s head to bring up his fifty in 33 balls. Unadkat''s second over, that produced 17 runs, opened the floodgates for Kings XI as Sarfaraz too joined the party and together with Gayle punished the bad deliveries. 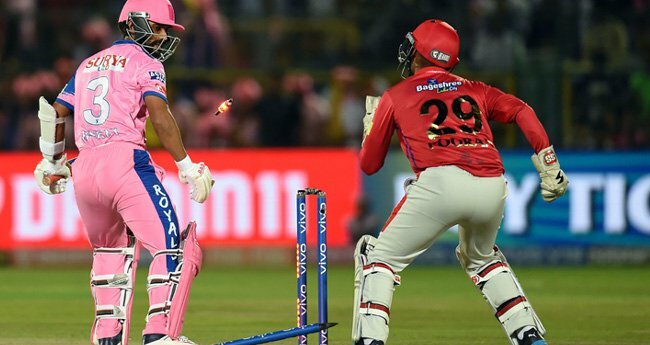 After playing cautiously initially, Gayle went on a rampage, stood on his crease and clobbered Stokes (2/48) for two boundaries and six before being holed out at midwicket fence by Tripathi in the fifth ball of the same over. Gayle and Sarfaraz added 84 runs for the third wicket and in the process gave Kings XI the much-needed momentum. After Gayle''s dismissal, Sarfaraz took the onus on himself and took Kings XI past the 180-run mark.